Located in Darling Harbour, the premier entertainment destination sought to extend the luxurious atmosphere of their private Sovereign Room into the car park so that their high roller customers would be impressed by the casino as they drove into the facility. The Star Casino sought floor coating systems that would maintain their crisp colours despite the movement of heavy vehicles, and exposure to automotive oils and greases, heavy impacts and the cleaning regimen. Failure of the floors would not only present an unsightly and unclean appearance to customers, but also affect the safety of users if the floor signage was eroded. Alongside these aesthetic and functional demands, the car park floor had to meet a long list of strict practical criteria, such as being dust-free and odour-free as well as easy to clean and glossy. To achieve this stylish and luxurious look and the necessary functionality and durability, about 85,000 square metres of Flowcrete Australia’s specialist deck coating systems were installed across the five-storey car parking facility. 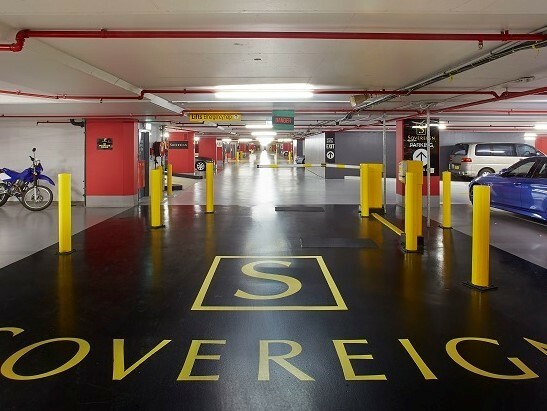 For the Sovereign Room’s parking zone, 11,500 square metres of Deckcoat EP and 1,500 square metres of Deckshield ID were applied in custom colours to craft a stylish and on-brand atmosphere in the by-invitation-only area. The Sovereign Room logo incorporated into the floor coating at the threshold between the car park and the exclusive Casino area reinforced the venue’s identity and image. Flowcrete Australia’s Managing Director, Sean Tinsley explained that Star Casino wanted their customers to be impressed by the casino from the moment they first arrived. The car park, therefore, needed every element to be able to maintain a decorative and unblemished appearance in the face of multiple potentially damaging factors. Since some parts of the car park were put through a lot of strain, Star Casino chose a high performance finish that would consistently provide the desired aesthetics despite the inherent challenges. Some of the highlights of the Star Casino car park project included parking bays and driveways defined by two shades of grey with harbour blue marking out the disabled spaces; clear pathways created around the car park for safe navigation by patrons by applying contrasting yellow and white line markings; and all line marking and hatching, including disabled bays completed to the Australian Standard AS/NZS 2890.6-2009. Deckshield ID Rapide in black with contrasting yellow demarcations was installed on the ramps, critical traffic junctions and entrances. Being a quick curing solution, Deckshield ID Rapide allowed these areas to be trafficable just an hour after installation. The car park was constantly operational throughout the 26-week application. To minimise inconvenience and ensure the safety of users, traffic management was factored into the refurbishment, including sectioning off areas of the site.